I am a HUGE fan of Sofia Coppola movies, and upon noticing that her wonderful movie The Virgin Suicides was based on a book, I knew that book had to be great. The five Lisbon sisters are the unnamed narrator's beautiful and mysterious neighbors. The narrator and his friends (teenage boys) are obsessed with every move the girls take and worship the ground they walk on. At first you'd think that the sisters are some perfect, angelic beings, but they're not. It's mentioned that they all have crowded teeth, and some walk duck footed or have upper lip hair. The girls are real people. (They felt too perfect to me in the movie. Kristen Dunst? AJ Cook? Come on.) The Lisbon parents are very overprotective, but when the youngest sister makes a suicide attempt, they become even stricter. I couldn't quite tell why the parents were so fanatic. Was it religion? Or just wanting to protect the girls' innocence? As time goes on and certain events happen, the girls are put on stricter and stricter lock-down to the point they are withdrawn from school and barely let outside. That's when the girls hit their breaking point and, well, the title comes into play. The book is a haunting look at how a typical white-picket fence community in the 70s reacts to "the year of the suicides" and tried to come together to protect itself. I wanted to know more personally about the narrator. He's telling the story as a middle-aged adult looking back at a year in high school, yet he's clearly still obsessed. I wish we could see more about how the girls' actions affected him in the few years afterward. Reading the book made me realize that the movie, in pure Sofia Coppola form, is too minimal. The book and movie are the same in that the use of dialogue is sparse, but the book gives us much more detail and insight into how the girls lived their lives and for all practical purposes, struggled to survive. I'm the same way! I only recently allowed myself to watch any Pride & Prejudice films because I've finally read the book. I watched the movie after reading the book and loved, loved, loved it! I really loved the book but have yet to see the movie! Thanks for reminding me!! I'm dying to read this (no pun intended) but I'm afraid that the movie will have tainted the experience too much. Especially if as you say, the characters are not mean't to be as perfect as the book. Yeah, I feel like it was few different boys all contributing to the story and the telling of memories, but I think there was one "main" boy who was really spelling it out for us. I sent my copy back to the library so I can't check! It was still a very well written use of plural narrators. 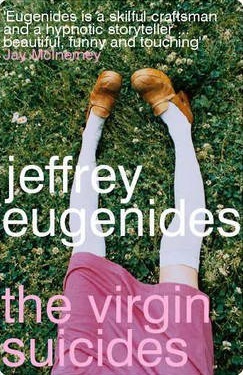 So, I'm assuming this was your first Eugenides book. You must must must read Middlesex. It was amazing! I haven't seen the movie, but I definitely want to after I read the book! I love that the girls in the book are realistic and the story itself sounds really interesting. I've been wanting to read this one for a while!! I loved this book when I read it and think it deserves a reread. Great review. This is sitting on my shelf waiting to be re-read, because I've read it a couple or three times now and love it, Jeffrey Eugenides is one of my go-to authors and this is my favourite book of his. I like the film, too - I think it captures that strange quality of always wanting to unravel a bit more of the mystery, but being prevented from doing so. That might be why I haven't read it for a while - I always want to know a little bit more than what I'm being given, and I agree the narrator is an intriguing character. Great review!